Last night I had the pleasure I attending the opening night of the art show France Here We Come at Caninet in Toronto’s historic Distillery District. 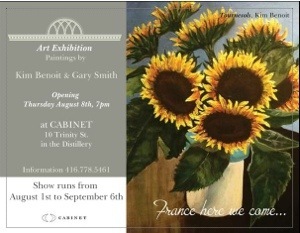 It features two fantastic artists – Gary Smith I have had the pleasure if knowing for almost 30 years, and Kim Benoit who I met just over a year ago at Gary’s art class. Gary has been a great inspiration for me over the course of our friendship and his artwork is absolutely amazing. He has an ability to capture mood, atmosphere and evoke emotions in his art. My favourite is his painting of The Marsh. Kim and I met at his Monday evening painting class at Luc Sculpture on the Danforth. Kim encouraged me to continue with my miniature oil paintings I did at the beginning of every class and see what the collection would look like after a year (see 31 paintings post) She is a wonderful lady and her art reflects her compassion for colour, texture and a variety in life. I encourage everyone to visit the show. The old brick walls industrial open ceiling and hand crafted wood furniture at the Cabinet are the perfect setting to showcase each piece.